The villa is located in Bartrès, 3 km from the centre of Lourdes. The villa is 15 km from the A64. 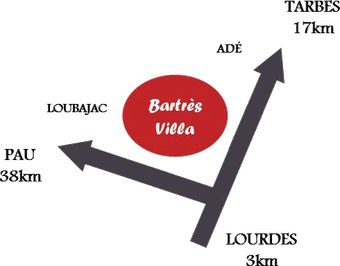 Take exit 12 marked "Tarbes-Ouest", then follow the road "RN 21"
The Bartrès Villa is owned by HCPT (Hosanna House & Children's Pilgrimage Trust), a charity registered in England & Wales (281074) and in Scotland (SC043743). Company limited by guarantee registered in England & Wales (1095198).